Burn permits are issued, renewed, and tracked at the Environmental Management-A Office, Monday through Friday during regular business hours. See the map below or contact the Air Quality Specialist at 873-784-9308. 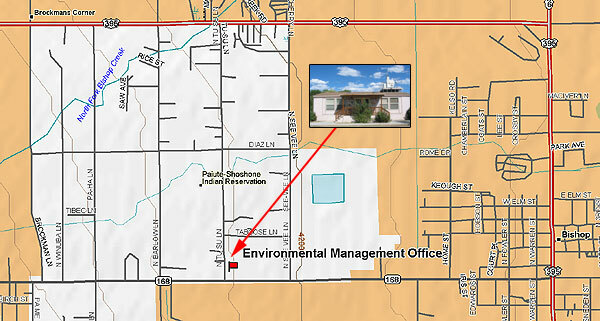 Residential permits can also be issued by EMO staff at the Tribal Administration Building. You may also dowload & complete the application form and bring it to the Environmental-A Office. Once the Air Quality Specialist receives your permit, it will be faxed to the Bishop Fire Department. Having burn permits on file with the Fire Department prevents unnecessary call outs. Why Do We Have Burn Permits? Burn permits are used to help protect public health and safety. They inform applicants about allowable burn times and days and acceptable materials for burning. Burn permits are required as part of the fire protection agreement between the Bishop Tribal Council and the Bishop Rural Fire Protection District (Bishop Fire Department). “Yes” burn days and “No” burn days restrict burning to days when it will not adversely impact air quality and when the fire risk is low. In the winter when the fire risk is low, “yes” burn days are declared when weather conditions are such that the smoke will disperse. “No” burn days are typically cold, calm days when the barometric pressure is high. In the spring and fall, conditions can change quickly. Even on yes days, the permit holder is relied upon to judge whether it is too windy to burn. In the summer when the fire risk is high, there may be long periods when there are only “no” burn days. This is the driest and hottest part of the year and decisions are based on fuel moisture. Information on “yes” and “no” burn days is available from the Interagency Control Center at 873-2555. It is updated daily at about 4:30PM. On “yes” burn days, burning is allowed between the hours of 5:00AM to noon. This restriction is to prevent escaped fires. This applies to all vegetative burning projects on the reservation.